The city recorder provides accurate information to the public and staff; maximizes the public's access to municipal government; provides a variety of services to the citizens of Jamestown; maintains the official records of the city government, overseeing the preservation and accessibility of public records; provides notice of all city council proceedings and recording actions taken by the city council; conducts fair and open municipal elections; maintains and ensures the accuracy of accounting data, financial reporting and record management; facilitates public relations between the citizens and the City of Jamestown; maintains accurate records management of all business proceedings (grants, bonds, contracts, etc. ); oversees payroll; provides public information and records upon request; and handles business licenses, permits, property taxes, etc. The City Judge is authorized and empowered to punish all offenses of city ordinances committed within the city limits. The position of City Judge is filled by appointment of the City Council. City Court session is held the last Friday of each month at 3 p.m.
Jamestown's Regional Planning Commission meeting is every fourth Tuesday of the month at 5 p.m.
*The Airport Committee meeting is the third Tuesday of the month at 6 p.m.
Our mission is to courteously provide our residents and businesses with accurate water, sewer and natural gas billing information through a knowledgeable and efficient staff. We strive to provide professional customer service at all times and to provide accurate and timely services to the citizens of Jamestown for billing questions, concerns, connects, disconnects and transfers. We at the City of Jamestown are proud to offer our residents beautiful parks and amenities. Whether you are looking for a quiet walking trail, playgrounds for your children or a gathering place for special occasions such as birthdays, family reunions or office picnics. Click below to see all we have to offer. Click here to view our parks. Our mission, in order to protect, preserve, and maintain the dignity, peace, and tranquility of the City of Jamestown and its citizens, is to endeavor to always take the initiative and strive for excellence in crime preventive patrol and investigation. Our Public Works Department consists of a variety of different divisions with a common goal of providing vital city services to the citizens of Jamestown. These divisions operate and maintain the city's storm water conveyance system, drinking water supply and distribution system, wastewater collection system, and wastewater treatment, as well as natural gas system. We will continue investing in the future of our water systems to insure quality water for generations to come. Please check our project page often for upcoming projects. Fleet Management is dedicated to providing the City of Jamestown with safe, reliable vehicles/equipment so that all divisions can perform their work efficiently and safely. The department organizes and performs complete asset management, maintenance and repairs of all vehicles and equipment. Locating & Mapping: Provides locating services for the City’s gas system in order to protect it from excavation damage. Construction & Maintenance: Responsible for maintaining the integrity of the system through rehabilitation programs and new construction projects. This sub-section installs gas lines, builds regulator stations, and performs gas line repairs. The City of Jamestown Street Department and its staff are responsible for maintaining city streets and other public right-of-ways. The department provides a wide variety of services that help maintain the quality of our city and neighborhoods. The Jamestown Wastewater Treatment Plant is a Sequencing Batch Reactor capable of treating up to 1.5 million gallons/day. The raw sewage from the collection system enters the plant at the Headworks where all the trash and grit is removed. It then continues by gravity into one of two SBR Tanks where it undergoes a biological treatment process to remove CBOD, TSS, Ammonia, Nitrates-Nitrites, and phosphorus. After the biological process the clear effluent then passes through the Chlorine Contact Chamber for disinfection with Chlorine Gas and De-Chlorination with Sulfur Dioxide. After Chlorination/De-Chlorination the clean effluent is then discharged into Rock Castle Creek. The effluent is tested daily in our lab to insure we are meeting the limits of our NPDES permit issued to us by the Tennessee Department of Environment and Conservation, Division of Water Pollution Control. The plant has recently undergone a $2,500,000 upgrade to make sure we have the most up-to-date process controls and equipment. With this upgrade, the Jamestown Wastewater Treatment Plant can continue to produce effluent that is among the cleanest in the state. Our city water system consists of an immense series of piping, valves, hydrants and components as well as three water storage tanks that deliver approximately 1.6 million gallons of drinking water daily. Our goal is to operate and maintain the water distribution system in such a manner as to efficiently and effectively deliver sufficient quantity and pressures to meet the demands of our city. The water treatment division has a variety of duties to perform: to acquire non-potable water and to treat the water through various state-regulated processes to insure the final distribution of high-quality and safe drinking water to the citizens of our community. Open since July 17, 1967, and located only 12 miles from beautiful Pickett State Park on the Cumberland Plateau, the Jamestown Municipal Airport prides itself in providing aviation service with small-community charm and convenience to Fentress and surrounding counties. 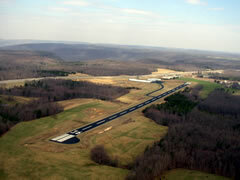 Jamestown Municipal Airport features a 3,498-foot runway, which offers users the flexibility of chartering many different types of aircraft. While the runway is still too short for some of the largest types of aircraft, it allows pilots to safely fly a variety of luxury and performance jets, as well as turboprops. In addition, the airport offers fueling, flight school, aircraft rental, hangar rental and more. Jamestown remains tucked away in the quiet, peaceful country of the Upper Cumberland – a hidden treasure for your discovery. Find us on the map. ©2019. All Rights Reserved. 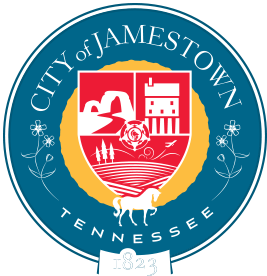 City of Jamestown, Tennessee. Website by WDStone & Associates.